New Hampshire is facing a crisis. During the next 20 years, the state’s working age population will decrease by 7.3% and the percentage of our state’s population age 65 and older will double in every county. * This lack of in-migration and aging workforce is already having a negative impact on employers who are unable to attract talented professionals. For companies to grow and prosper right here in NH, they need access to a younger, highly-educated workforce. That means the state needs to be able retain its homegrown talent, while at the same time drawing on Boston’s vast talent pool. An expanded rail system makes this possible. Passenger rail can play a key role in New Hampshire’s economic future. A recent study identified that rail expansion would generate thousands of jobs, hundreds of millions of dollars in real estate development and it attracts and retains young talent. The NH Capitol Corridor Rail Expansion Project would expand MBTA commuter-rail service from Boston to southern New Hampshire. 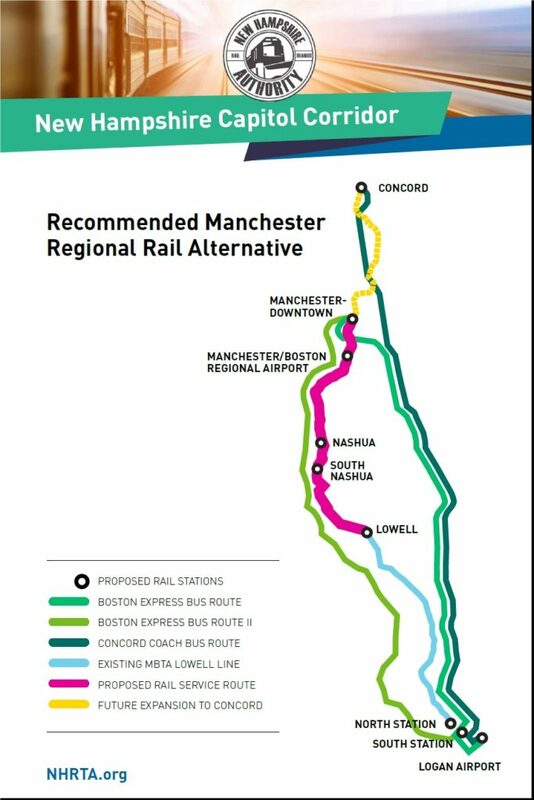 There would be two stops in Nashua and one stop each at the Manchester-Boston Regional Airport and in downtown Manchester. 668,000 weekday riders per year are expected – not counting weekend or leisure travelers. **Results of a 2015 Public Policy Polling poll.